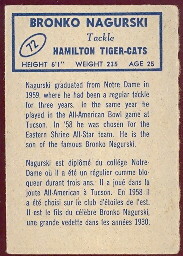 The 1962 Topps CFL Set consists of 169 cards. They originally were issued in perforated pairs and the individual cards measure 1-1/4" X 2-1/2". The Set includes all of the Canadian Teams.